Medihoney Antibacterial Honey Apinate Dressing creates a microenvironment that supports healing and provides an antibacterial barrier. Medihoney dressings have been shown to improve healing rates by up to 30% compared to standard dressings and to provide faster debridement than some hydrogels. 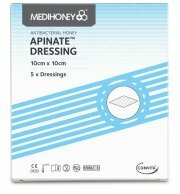 The Apinate Dressings contain Antibacterial Leptospermum (Manuka) Honey and Calcium alginate fabric.